Among the most exciting dance performances taking place in this young 2016 season is a lineup of mature dance talent poised to challenge our culture of youth. In a world too often neglectful of hard-won skill, Zephyr Dance artistic director Michelle Kranicke brings to Chicago some of the world’s most celebrated mature dancers in the aMID Festival at Links Hall. Kranicke and two headline performers, Bebe Miller and Deborah Hay, discussed the performance in a series of interviews. Tell me about your motivation for putting on this festival. 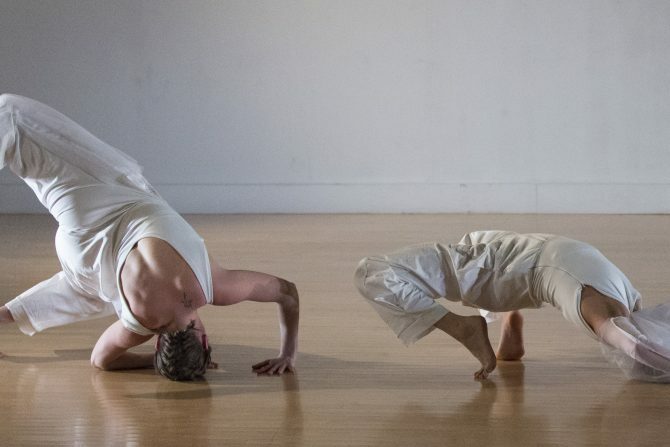 Kranicke: A lot of the motivation for the festival was the fact that dance tends to identify with a younger age demographic, and older practitioners tend to fall away from performing. That’s unfortunate because I think it’s really important they stay on stage, and that their ideas are filtered through older bodies or their own body. There are a lot of choreographers that continue to make work but they either work out their ideas on younger bodies or their choreography is filtered through a specific technical facility that is often embodied by a very specific kind of dancer: usually younger, very technically proficient. And there’s nothing wrong with it. Well, it’s a tendency to exclude older dancers, which is a net negative. Kranicke: It’s a negative. Sometimes you long for someone who’s going to push the envelope a little bit. I think as you grow older and you’re confronted with your own diminishing physical abilities, there are some psychological challenges that you’re going to face in the studio. And if your entire identity as a dancer and choreographer is through a filter of jumping, twirling, being able to get to the floor and get up quickly, you’re going to be deeply unsatisfied with your own capacity because that stuff is going to go away. But what takes its place is an authority and a maturity that comes from years of performance and allows you to command the attention of a viewer in a different way. What I love about aMID and some of the artists coming in is that they’re doing just that. Bebe Miller, your last visit to Chicago was in 2012, the Dance Improvisation Festival at the old Links Hall. What about the aMID Festival compelled you to return? Miller: I was interested in performing with these other dancers. We’re all in the same program, I respect them and most of my company performances involve other dancers, too. And I have done a bunch of performing on my own in recent years, so I thought, “Hm! This is worth pursuing.” I’m working with Darrell Jones, with whom I have a long history. A lot of my thoughts about performing at this point in my career are, “Where am I now? Why is this interesting and who am I with?” I asked Darrell if he’d be interested in participating; we don’t know what that would be, but we were both open to it. Dance can be distinctly ageist. Miller: It’s not just America, but the field of dance is considered a young person’s thing. I’m in my sixties; we know that it’s not just a young person’s field anymore—all hats off to aMID for doing this—but I think it’s even beyond that. I think we’re living in a moment where there is more expectation and evidence that artists of my generation keep on going, whether we’re writing or filmmaking or doing more spoken word, performing or choreographing. I’ve also been doing this series of performances with the Wooster Group in New York called “Early Shaker Spirituals.” It’s a group of five women and we are all sixty and over, including Frances McDormand, Suzzy Roche, Cynthia Hedstrom—we’re all of a certain age and we’re singing these Shaker songs. So, for me, just the fact of my age as a performer isn’t so much an issue. I feel that maybe we’re in a time when we can relax a bit and do what we do. Deborah Hay, why did you feel compelled to participate in aMID? You haven’t actually performed in Chicago since the 1980s. Hay: It’s very simple. I love language, and I love the word “aMID.” I’m really only thinking of it like the word “amidst.” The aMID Festival. I loved that so much, that that is what convinced me. Can you tell me about the work you plan to present for the festival? Hay: Well, it’s very stripped down. It’s a solo for up to twenty-five people, and it can be performed anywhere. It can be performed in a lobby. There’s ten minutes of my performance and then there’s a ten-minute break, and what happens in that ten-minute break is really up to whatever happens and then there’s ten more minutes of performance. And that’s it. I’m at a point in my career where it’s stripped down to the most minimal—and complex—in that sense. I’d love to discuss the notion of how to free dance from its preconceived notions, from this sense of what we expect from a performance. How does your work do that today, and how has that effort to do so changed for you over time? Hay: I just feel like the tension has gotten finer and finer. When you read about dance and do dance, we first go to this solid, three-dimensional body to do it and to look at it, we’re admiring it, we’re questioning it, we’re looking at this body and what it can do. And as I get older and deepen my interest in the field of dance, I’m not interested in what my body can do, of course. It’s just so much bigger than what it can do, when you think about the imagination, when you think about seeing, how we perceive. So that’s the evolution of my work.